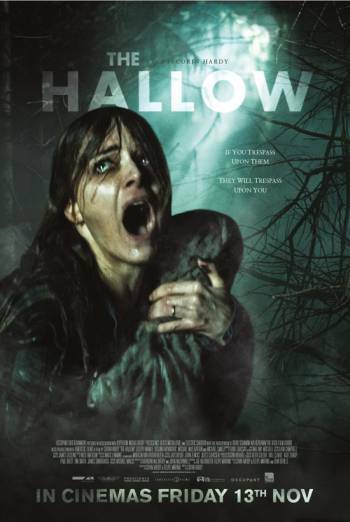 Summary THE HALLOW is a British horror film about a couple who move to a new home in rural Ireland, only to be tormented by supernatural creatures intent on stealing their baby. THE HALLOW is a British horror film about a couple who move to a new home in rural Ireland, only to be tormented by supernatural creatures intent on stealing their baby. Sustained sequences of threat show a couple and their baby being tormented by supernatural creatures, who break into their home and car. A nail is held to a baby's head. There are also scenes of strong horror: a creature almost stabs a character in the eye; a character stabs another in the chest, but there is no sight of injury detail; a creature is beaten and then decapitated. A character begins to transform into a creature, whose skin is shown decaying throughout the stages of the transformation; some of these images are gory, and include sight of horns growing from the skin.